Perfino is a highly complex piece of software designed to provide the means to monitor the activity and interactions between multiple Java virtual machines, providing information on their performance as well as their mistakes. A license to supervise all perfino no limit to the number of monitored JVM or any other metric, such as commercial transactions registered. No matter how large your system or how many micro-services want to monitor their license perfino has you covered. Perfo When you log on, the board shows if all is well, or if something goes wrong. perfino gives you detailed control over what level of performance is acceptable for your application. The board is where it begins to delve into the more detailed views of data. 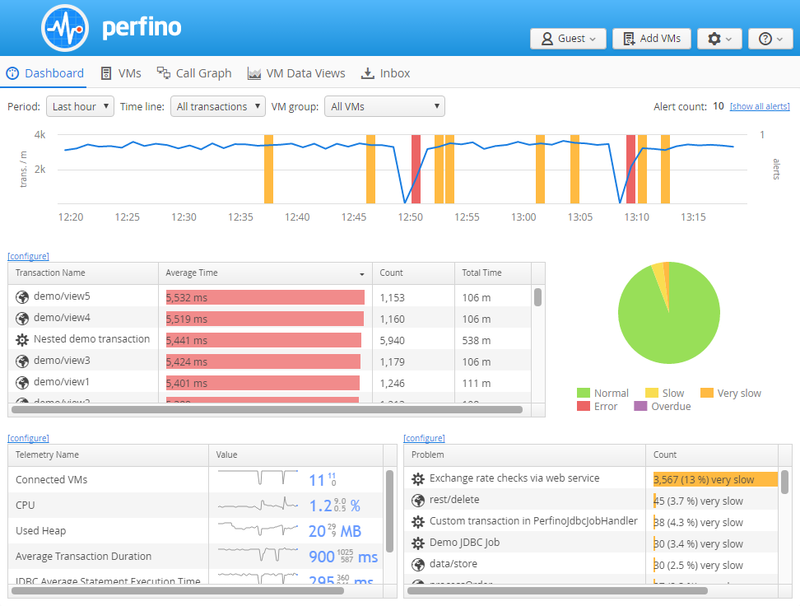 perfino can monitor business transactions that span multiple virtual machines. A call on the web layer to EJB server and then a web service: in Punched, these operations are connected, even when a level sampling method is performed. The call graph not only shows the complete picture of what is happening now, but what happened in the past.